Roller-skating is a complete aerobic workout that engages all of your muscles. Whether roller-skating is a better exercise than walking depends on your age, fitness and tastes. Although the demands of roller-skating have been compared to jogging, it takes a little longer to learn how to balance on spinning wheels. If you’re itching to go all out, join a roller derby team. 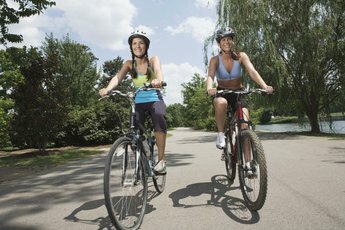 Warn your partners of the risk of becoming “derby widows.” They may lose you to the sport, according to Joanna Della Ragione’s article “Rollerskating: A Wheely Good Workout” in "Express." If you need a practical and convenient fitness regimen, a vigorous daily walk will do the job. Propelling yourself through space with a weight on each foot will help to build your ankles, legs and hips. The lean-forward, bent-knee position in roller-skating will place extra stress on your hamstrings and lower back. While trying to balance on wheels and move forward at the same time, your core stabilization muscles will come into play. If you’re swinging your arms to gain momentum, you can also build your upper body. 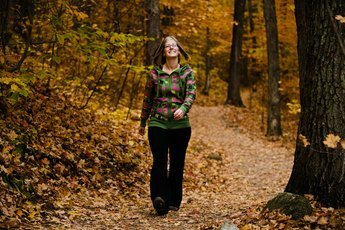 Walking can strengthen your feet, knees, legs and hips. 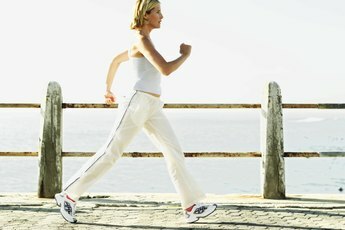 Runners use walking as a form of cross-training to give their joints a break. Maintain an upright posture and keep your feet low to the ground. Both roller-skating and walking are low-impact exercises. In contrast to running, neither exercise will pound your knees. But your chances of hurting yourself by falling or crashing are much higher for roller-skating. Injuries can range from broken collarbones to sprained wrists from taking a tumble at an awkward angle. If you’re feeling nausea, palpitations, dizziness or chest pains while skating, then you’re overdoing it and should stop. For sedentary people who are just beginning a fitness regimen, walking poses a minimal chance of injury. In addition, you can daydream and do a brisk walk at the same time. You don’t have to be as mentally alert as you do when roller-skating and avoiding obstacles in your path. The American College of Sports Medicine recommends that you take various factors – convenience, skill and social climate – into account when planning a long-term fitness regimen, according to “A Message from the President’s Council” on The President’s Challenge website. Compared to walking, is roller-skating too difficult or frightening? Do you have enough balance to roller-skate and enjoy the workout without looking for the nearest lamp post or mail box to cling to? Are you a social person who enjoys working out in groups or someone who prefers a brisk stroll alone? Figure out what form of exercise suits your personality and design your regimen to include those physical activities. Kiplinger’s Personal Finance: Roller-skating is Back-and Big! Essentials for Health and Wellness; Gordon Edlin, et al. Does Walking Make the Buttocks Bigger?